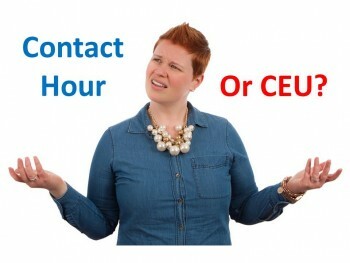 Tag Archives: Contact Hour or CEU? The definitions of contact hour and continuing education unit, or CEU – and the difference between the two – are often misunderstood. Some professions (such as Occupational Therapy and Speech-Language Pathology) prefer the term CEU. Most mental health professions (Psychology, Social Work, Marriage & Family Therapy, etc. ), however, use CE contact hour or credit hour. Although the terms seem interchangeable, they have different meanings. One CE contact hour is equal to 50-60 minutes of a learning activity, depending on jurisdictional requirements. One CEU is equal to 10 contact hours – meaning that one contact hour is equal to .1 (1/10 or one tenth) of a CEU. So if your particular licensing board requires that you complete 3 CEUs per renewal cycle, that can be interpreted as 30 contact hours required.